I’m not going to go into detail about the R.M.S. Queen Mary’s history. There are countless sites and books out there on the subject, and the ship’s history is so monumental that it would take volumes to adequately describe it. 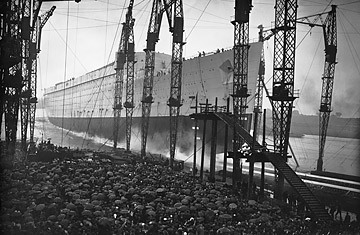 But, in a nutshell, the Queen Mary, launched on September 26th, 1934, was one of the last great Atlantic liners in existence. She’s also renown for being extremely haunted. 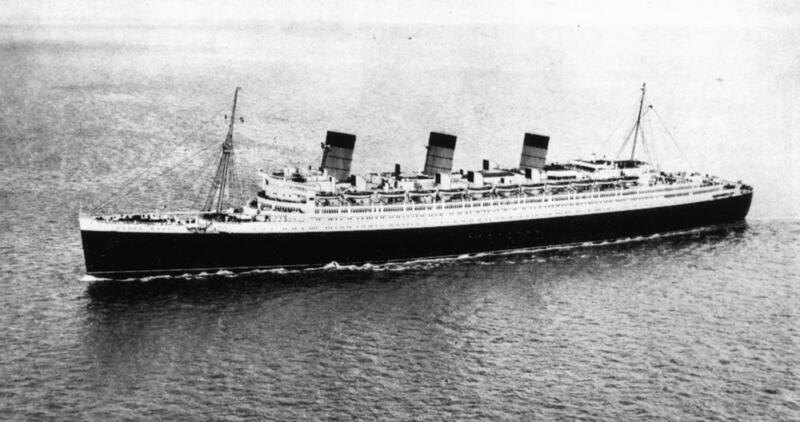 During her 70-year history, the Queen Mary was the site of at least 49 reported deaths. In addition, in October 1942, she was involved in a horrible accident, which could account for some of the hauntings. Used as troop ship during World War II, she transported nearly one million servicemen across the sea. The enemy had put a high price on her head, and so on one of her jaunts across the sea, she was accompanied by the destroyer, Curacoa. The destroyer got too close, and the Queen Mary ran right into the middle of the vessel, splitting the Curacoa in half like a hot knife through butter. The Queen Mary sustained minimal damage to the sides and bow, but the destroyer quickly sank. As a result, 330 souls were lost at sea. So there are plenty of potential spirits to haunt her hallways. And indeed, the Queen Mary has been the site of a number of unexplained phenomena since the City of Long Beach purchased her when she was retired in 1967. The new owners began an extensive renovation and conversion of the ship which would incorporate a hotel, banquet, and museum facilities into her hull. The Queen Mary now had a rare chance at a second life, and, thankfully, she exists today for those who want to study her history and hauntings. The reported hauntings are many and include a young crewman in the engine room, swimmers in the first-class pool, a man in black, and a woman in blue. I confess that I’m fascinated with the majestic Queen. I don’t know why. I only know that something about the ship interests me immeasurably, and, sometimes, it seems like it’s calling me. I’ve never visited it personally, but I hope to someday. Like most people, I’ve read about some of the hauntings aboard the ship and wanted to make a psychic connection to learn the identities of some of the spirits there–or to find out why the ship beckons. These represent some of my earliest attempts at making a psychic connection. The first time that I tried to connect to the ship, I failed. The second time, I didn’t fare well either and decided that I just didn’t know the ship well enough, and thus was unable to make a good connection. I bought some books on the ship, did some research, studied pictures of it, and tried again. The third time, I connected but had only minor success, in that I didn’t learn anything substantial. I kept seeing an attractive woman in a beautiful light-colored, frilly dress on deck. She looked young, but I got the feeling that she was much older than she appeared. Her personality was strong, and she wanted attention so badly that all I could see was her, her, her! She wouldn’t let me connect to anyone else or refocus my investigation elsewhere on the ship. And she refused to tell me who she was, why she was still on the ship, or the circumstances of her death. At a later date, I may try to contact her again and see if I can get more information from her. The Fourth time that I tried to connect, I failed. I knew what part of the problem was. The ship was big, and I couldn’t envision the way that it looked inside. Of course, I’d seen pictures, and I had some crude deck plans, but seeing it in three dimensions was a different thing entirely, and that’s what I needed to do in order to form the needed mental image that would allow me to connect. I decided that it might help if I had a physical item from the ship. So I bought a 1955 postcard of the Queen Mary (passengers sent these from the ship) and a menu from around the same period. But before these items arrived, I couldn’t wait. I tried again. And the fifth time that I tried to connect to the ship, I had a terrifying experience. I made a connection and found myself on the ship, walking the long, resplendent halls. Then I found myself being followed by a man in a black suit. He scared me. I sensed that he was not a good person and had murdered a woman who’d been a passenger aboard the ship. What’s more, he had never been caught and punished for the crime. I’m not sure whether this murder actually happened on the ship or when the ship docked. I only knew that it happened, and this guy had done it. At any rate, he kept following me, and I kept fleeing. The ship faded away, and I found myself on some dark city streets that I didn’t recognize, the man in black ever lurking behind. I could look across the street or just behind me and espy his intimidating shadow. I kept telling myself that he couldn’t hurt me. But I didn’t know if he could or not as I was new at this. I’ve since learned that a negative entity can indeed be dangerous. Just how dangerous? No one really seems to know. I’ve also learned that I can usually snap out of a bad experience like this—but it can take a few minutes to do so. Along the way, I ducked into some empty houses to evade him. I decided that I’d wait a bit and start back out, looking for a way to safety. I wasn’t sure where I was going. But every time I thought I’d lost him, I saw his long shadow stretching across the way. The whole thing was horrifying and went on for what seemed like forever. And it ended when I got on either a train or sub. I’m not sure which it was. By then, I was gaining a measure of mental control. I took a handgun out of my pocket, (I don’t know where it came from. I don’t like guns, and so I was surprised that I had it with me) and I shot at him. But I only managed to strike the window glass–which didn’t break–and then I finally snapped out of it. Perhaps these images have significant meaning, but not knowing more about the mysterious man in black, I don’t know what they could symbolize. Nor do I know the identity of the man–only that he wore a black suit typical of the 1930s and, he appeared to be a refined, upper class gentleman. I didn’t try to communicate with him, because I sensed that he was wicked, and I wanted only to evade him. This was the first negative entity that I’ve encountered during a vision and one that I’ll never forget. I haven’t attempted a psychic connection with the spirits aboard the ship since. I will someday though, because the ship is still calling me, and I know there are so many mysteries aboard her that are worth exploring. I’ll also have the benefit of holding two items that were actually on board the ship, which should help me connect. I will update this page when I have something worth sharing. Yes, the ship is haunted, and though most of the spirits on board are harmless, I know of at least one who’s not. If you visit the ship, stay away from the man in black! Update: 9/17/2015: I’ve not reconnected to the ship since I did this investigation 11 years ago, because I’m too afraid of the man in black. Looking back at this early investigation, this was a very strange connection, indeed. I’m amazed that I not only left the ship and strolled city streets, even getting on a train or sub, but also had a purse which held a gun. And I’m shocked that I actually shot at an entity. That was the first and only time that I’ve physically reacted in such a way during a vision. I’m usually not so “interactive” with the environment during a vision and merely see the images as if on a TV screen. But, during a few of my visions, I’ve experienced pain or the emotions of a victim. I have to wonder now, if, perhaps, I was in an entity’s skin when I did those things, perhaps one of the man in black’s victims. Every once in a while, this happens and I find myself in another’s body. But it’s very rare. If that was the case, then it meant that the victim had taken me over during my connection. Why? Because she wanted me to know about this man who had stalked her. I’m assuming, considering the gun, that she was victorious over him. Clearly, she’s a ghost on the ship, which is where I would have picked her up. Perhaps the man in black stalks her still. I could only learn more by going back. Perhaps I will in the near future. If so, I’ll update this page with my findings. Also, since this investigation, I’ve grown tremendously as a psychic. I no longer need physical items in order to connect. They may or may not help. And I certainly don’t have to be able to visualize the environment before I connect to it; I will find myself there regardless–even if I don’t understand what I’m seeing. I’m happy to find this web site. This was a particularly wonderful read! !